sticky rice cake - "Bánh ít"
It is true that “Banh it” is a must try specialty of the Central Region in Vietnam! Commonly, there are two kinds of “Banh it”. 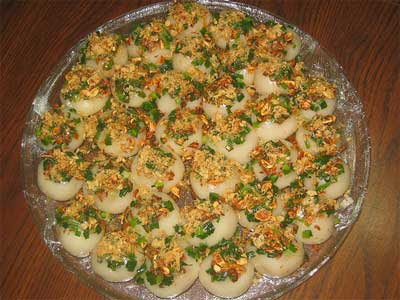 The first one is “Banh it la gai”, which is sticky rice cake with coconut or green bean stuffing wrapped in pinnate leaf. The second one is “Banh it tom thit” - glutinous rice cake with meat and shrimp, its name means “little meat shrimp cakes”, the stuffing is made of ground pork and shrimp mixed with spring onion and other spices. A popular saying goes: "If you wish to eat banh it la gai, get married to a Binh Dinh man to increase your life experience". It shows how essential “Banh it la gai” is to the people in the central region. Originating in Binh Dinh Province on the central coast, “Banh it la gai” has become a veritable specialty of that region of Vietnam. "Banh it la gai" is made from five ingredients - sticky rice, "la gai" (a type of thorn leaf popular in the central region), sugar, green beans (or black beans) and a banana leaf. The “la gai” is boiled and then ground in a stone mortar until its green colour turns black. The sticky rice is ground into flour. The sugar is dissolved in water and then boiled down to make syrup. Then the three ingredients are mixed together to make the dough. Meanwhile, the green beans are soaked in water for hours and then whipped before steaming. After that the well-done beans are ground and rolled into balls used as fillings for the dough. The dumpling can also be made with sweetened ground coconut instead of beans. Either way the banana leaves are usually put quickly on the fire or dipped in hot water to make them soft so that it is easier to wrap the cake with them. The little packages usually are shaped like pyramids with square bottoms. Then people arrange the packets into a pot for steaming. Visiting Binh Dinh, tourists can discover how “Banh it” often stands right in the centre of locals' lives. In death anniversaries, it is acceptable for there to be no fish or meat, but there must be “Banh it la gai”. In marriage rituals, a tray of “Banh it la gai” is the gift of the bride’s family to that of the groom to show the skillfulness of the bride who has made the Banh it together with other villagers. In the former imperial capital of Hue in Thua Thien-Hue Province, tourists can also find “Banh it la gai” and another type of “Banh it” called “Banh it tom thit”. The cake is a little ball of sticky rice flour stuffed with shrimp and pork. The tasty morsel is served plain or wrapped in banana leaves and is one of the indispensable dishes in the death anniversaries of a Hue family. “Banh it” is also popular in the historic town of Hoi An in Quang Nam Province. There tourists can find “Banh it” not only at family parties, wedding ceremonies and death anniversaries but also at restaurants. Hoi An has two types of “Banh it”: one with green bean filling and wrapped in banana leaves called “Banh it la gai nhan dau xanh” and the other also filled with green beans but served plain called “Banh it la gai tran”. Unlike common “Banh it la gai”, “Banh it tran” usually is pink and smells like la dua (a type of leaf that smells when it is steamed). A famous “Banh it la gai”-making family lives on Nhi Trung Street in Hoi An. Stopping by their ancient house, tourists can learn all the stages of making “Banh it”. 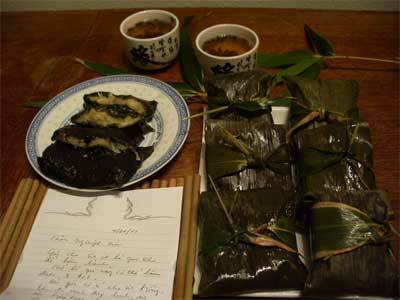 They can see how people prepare “la gai”, whip beans, grind sticky rice and form the dumplings. 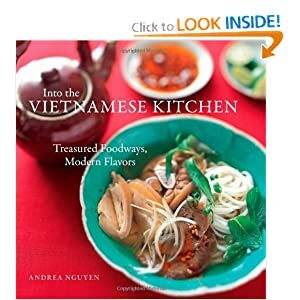 Above all, they can enjoy “Banh it” right after it is steamed.